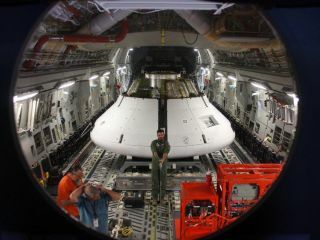 A model of NASA's Orion spacecraft is loaded into a C-17 airplane on May 1, 2013. The capsule was dropped from an altitude of 25,000 feet (7,620 meters) above the Arizona dessert to test its parachutes. NASA conducted a successful test of its next-generation spaceship last week, in an exercise designed to simulate two different types of parachute failures during landing. A prototype of the Orion spacecraft landed safely in the Arizona desert May 1 after it was dropped 25,000 feet (7,620 m) from a C-17 airplane as it flew over Yuma, Ariz. During the test, the mock capsule was traveling about 250 miles per hour (402 km/h) when its parachutes were deployed — the highest speed the Orion spacecraft has experienced so far in its testing phase, NASA officials said in a statement. A model of NASA’s Orion spacecraft glides to a successful touchdown during a test of its parachute system on May 1, 2013. Orion's three main parachutes, which gradually slow the capsule for landing, weigh 300 pounds each and can cover almost an entire football field. Simulating a parachute failure enables NASA to demonstrate that the system is reliable even when something goes wrong. Data collected from the tests also help engineers refine their models and designs. "Parachute deployment is inherently chaotic and not easily predictable," Stu McClung, Orion's landing and recovery system manager, said in a statement. "Gravity never takes any time off — there's no timeout. The end result can be very unforgiving. That's why we test. If we have problems with the system, we want to know about them now." To test the Orion parachute system on May 1, 2013, engineers rigged one of the test capsule’s three main parachutes – the middle parachute in this view – to skip one stage of its inflation, putting additional stress on the vehicle as it opened. Testing irregularities allows engineers to verify the parachutes are reliable even when something goes wrong. This type of parachute failure was one of the most challenging to simulate so far, but is a crucial step toward demonstrating that the spacecraft is safe enough to carry humans, said Chris Johnson, NASA's project manager for the Orion parachute assembly system. "The tests continue to become more challenging, and the parachute system is proving the design's redundancy and reliability," Johnson said in a statement. "Testing helps us gain confidence and balance risk to ensure the safety of our crew." A model of NASA's Orion spacecraft is poised to be dropped from a C-17 airplane 25,000 feet (7,620 meters) above the Arizona dessert to test its parachute system on May 1, 2013. The Orion spaceship is being designed to carry astronauts on exploration missions to the moon, asteroids or Mars. The gumdrop-shaped capsule measures 16.5 feet (5 m) wide at its base, and weighs approximately 23 tons. Orion's parachute system is the largest ever built for a manned spacecraft, NASA officials said. Fully inflated, the three main parachutes can almost cover an entire football field. During landing, the parachutes are designed to slow the capsule before it splashes down in the Pacific Ocean. NASA will test Orion's parachute system again in July. For that test, the mock capsule will be released from a higher altitude: 35,000 feet (over 10,600 m). In September 2014, NASA plans to conduct the Orion spacecraft's first unmanned launch test.